The title of this “The Best…” list is pretty self-explanatory. 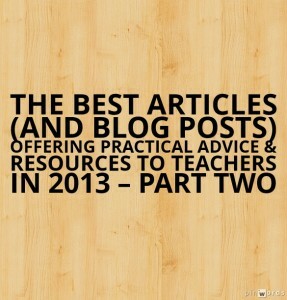 What you’ll find here are blog posts and articles this year (some written by me, some by others) that were, in my opinion, the ones that offered the best practical advice and resources to teachers this year — suggestions that can help teachers become more effective in the classroom today or tomorrow. Some, however, might not appear on the surface to fit that criteria, but those, I think, might offer insights that could (should?) inform our teaching practice everyday. For some, the headlines provide enough of an idea of the topic and I haven’t included any further description. Creating and Using Video is by Edublogs’ Sue Waters, and is one of the most useful posts I’ve seen this year about helping students create online content. It’s very complete, and shares many examples. I’m adding it to A Potpourri Of The Best & Most Useful Video Sites. ‘Listen, Empathize, Connect’ For Student Motivation is the last post in a three-part series I’ve published at Education Week Teacher. It includes links to all the posts in the series, and I think you’ll find all the guest responses useful. I’ve posted a Collection Of Tweets From Second Week’s Chat On Classroom Management over at Education Week Teacher. It marked the end of a two-week Twitter “chat” (using the hashtag #classmgmtQA ) on my new Education Week-published book, Classroom Management Q&As: Expert Strategies for Teaching. It’s was a very active two weeks, with my tweeting out quotations from the book, along with questions, and receiving many reactions. You can see the first week’s collection here. Choice Equals Power: How to Motivate Students to Learn is a nice article over at KQED’s MindShift blog about an online conversation I had during Connected Educators Month. It’s been quite popular, and I think offers helpful ideas. Teachers Should Be Friendly With Students But Not Friends is the title of an excerpt that has just been published from my book,Classroom Management Q&As: Expert Strategies for Teaching. It’s been published by Middleweb. The excerpt includes a contribution from Rick Wormeli and my thoughts, too. Screencasting In The Classroom is a guide from Kathy Schrock (thanks to Vicki Davis for the tip). I’m adding it to The Best Tools For Making Screencasts. 5 Powerful Questions Teachers Can Ask Students is from Edutopia. I’m adding it to The Best Posts & Articles About Asking Good Questions.For Teachers, Wired Classrooms Pose New Management Concerns is from Education Week. Skills Practice | Writing Effective Openings is an exceptional lesson plan at The New York Times Learning Network. I’m adding it to The Best Websites For K-12 Writing Instruction/Reinforcement. Simple ways to differentiate materials for mixed level classes is an excellent post by Rachael Roberts. It’s focused on language teaching, but the ideas can be applied to any class. I’m adding it to The Best Resources On Differentiating Instruction. Using ‘Self-Compassion’ to Recover From a Bad Day is the last post in my Education Week Teacher series on recovering from a bad day in the classroom. You can find links there to the other posts in that series. This Year’s Shipment Of Stress Balls For Students Has Arrived! Here’s a link to my article at Education Week that doesn’t require free registration — Developing Teacher Leadership For The Long Haul. By the way, the article also includes links to previous pieces I’ve written on developing student leadership and on encouraging parent leadership. Plus, this Ed Week piece is accompanied by a seventeen minute narrated slide presentation I gave on the same topic. Five key strategies to get/keep kids engaged at school is an excerpt my new book on Classroom Management. It was published in The Washington Post. Photo: What Should A Professional Learning Community Discussion Look Like, Sound Like, Feel Like? Say What? 5 Ways to Get Students to Listen is from Edutopia. I’m adding it to The Best Ideas To Help Students Become Better Listeners. Response: Helping Students Develop a Desire To Read At Home is a post over at Education Week Teacher. It includes responses from Donalyn Miller and Myron Dueck, and I throw in my own ideas. Digital Curation: Putting the Pieces Together is an excellent post by Sue Waters discussing curation and offering many suggested online tools. I’m adding it to The Best Posts & Articles About Curation. Teach With Movies has been a very helpful site for years sharinglesson plans and student hand-outs to use with popular movies. Happily, it is now free to use (it used to cost an annual fee), and I think can be helpful to teachers — especially for substitute teacher plans! Inside Classroom Management: Ideas and Solutions is a special feature from Education Week Teacher. It includes videos, interviews, columns — you name it. Most can just be clicked-on, though a few require free registration to access. It looks pretty impressive. Response: The Best Advice On Doing Project-Based Learning is a post over at Education Week Teacher. 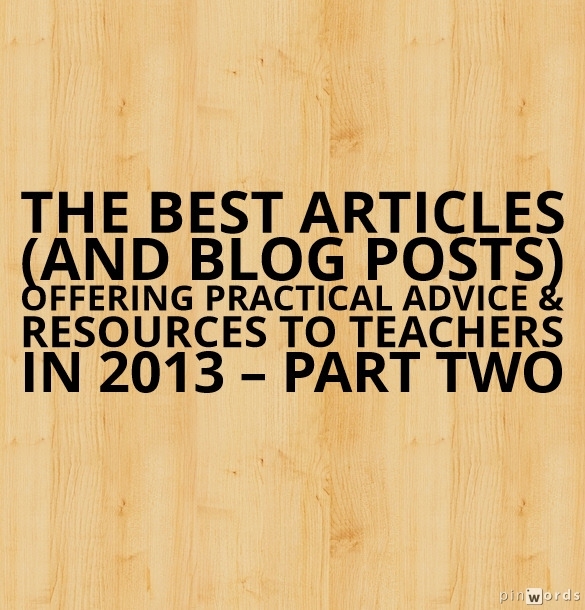 Suzie Boss provides the primary guest response, along with many suggestions from readers. Writing Instruction & the Common Core – Part Three one of my posts over at Education Week Teacher. It includes links to all three posts in the series. An Extremely Important “Take” On “Wait Time” — One That I Hadn’t Thought About Before…. The California Educator, the quarterly magazine of the California Teachers Association, published a short interview with me on student motivation. You can read it here. School Leadership Briefing just posted a fifteen minute audio interview they did with me over the summer. Efforts to improve our schools are typically focused on teaching, curriculum, and testing, but ignore a critical piece of the puzzle—the students. 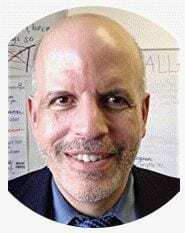 In this segment, Larry Ferlazzo, author of the book, Self-Driven Learning: Teaching Strategies for Student Motivation, joins us to talk about what it takes to create intrinsic motivation in our students and how school leaders and teachers can engage students so they care about wanting to learn. Setting the Stage for Change Toward Differentiation contains a very useful chart that was developed by Carol Tomlinson and others. I’m adding it to The Best Resources On Differentiating Instruction. Q & A Collections: All Of Them In One Place! 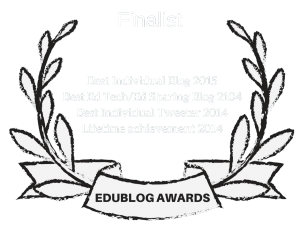 is a collection of my Education Week Teacher posts. They’re all organized by category. Richard Byrne has created a nice list of 47 Alternatives to YouTube. Yes, it’s nice and useful. However, the killer part of what he’s done is create a custom search engine for those 47 sites. If you don’t have teacher access to YouTube at your school, you’ll definitely be using this search engine a lot. “A Good Beginning is More Than Half of the Whole” is title of part two of my Education Week Teacher series on starting the new year strong. A link to Part One is included. Do We Want A “Community Of Learners” Or A “Classroom Of Students”? You might also be interested in my other over 1,200 “The Best…” lists and, particularly, this year’s end-of-year favorites.